The Next Generation remotely-operated hydrographic survey boat with unmatched usability, exceptional design, survey-grade construction and high quality instrumentation. CEE-USV™ is a state of the art, high-performance survey boat incorporating a single beam echo sounder, GNSS positioning, live video, and on-board data management. A high bandwidth radio link to the dedicated CEE-LINK™ shore station allows the operator to see precise bathymetric survey results in real time. Since 2011, CEE HydroSystems has been working with USVs and recognized the challenges users face. Multiple on-board components and numerous critical data communication settings present a significant risk of downtime through equipment setup issues. The CEE-USV™ is designed to eliminate these challenges. The unique CEE echo sounder technology reduces the potential for field problems: all components are integrated and installed in a single enclosure, simply turn on the power and start surveying – even when using a local RTK base station. The removable echo sounder and positioning system is fully interchangeable for manned boat surveys. With a network (Ethernet) data link accessible through a shore laptop internal WiFi or the dedicated long range CEE-LINK™ shore radio module, data telemetry requires no user management. As soon as the USV data module is powered-up, the survey data are ready on the shore for acquisition. For security and flexibility, all survey data – position, bathymetry, and quality control information – are recorded on-board for complete redundancy, ready to be directly imported into survey software as needed. With the CEE-PILOT™ robotic control module, bathymetric surveys can be completed with spectacular line-following results for premium survey deliverable accuracy and credibility. The integrated CEE-USV™ is simultaneously the most advanced and easiest-to-use remotely-operated single beam survey boat on the market. The CEE-USV has an echo sounder and positioning system specially designed for remote deployment; the new dedicated CEESCOPE-LITE manages all aspects of the survey from GNSS positioning, echo sounding data collection to real time telemetry. With a single enclosure and the absolute minimum number of connecting cables, the CEESCOPE-LITE may be removed and reinstalled after use on a manned boat in a matter of seconds. The CEE-USV meets an exacting standard of construction for all components from the hull to the antenna connectors. The autonomous navigation module upgrade available for the CEE-USV™ offers a unique architecture to maintain the simplicity of operation that is the core principle of the CEE-USV™ design. It requires no additional software to operate, no troublesome remote PC on the vehicle, no additional radio communication equipment, and no additional training is needed. The operator simply selects whether the survey lines are run manually or automatically with a mode switch on the hand controller. The entire bow portion may be easily removed for transportation. The CEE-USV™ will fit into small vehicles and even helicopters, courtesy of the drastic reduction in length with the bow detached. This wonderful design feature offers users the benefit of a long hull (high performance) without the drawbacks in portability. 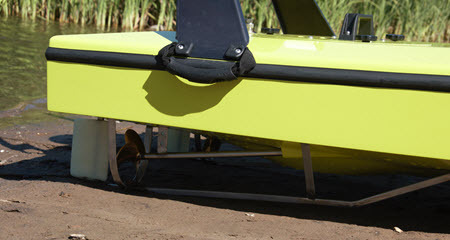 As the bow is completely sealed, it also provides emergency flotation that ensures the boat cannot sink even if the entire rear segment is filled with water. 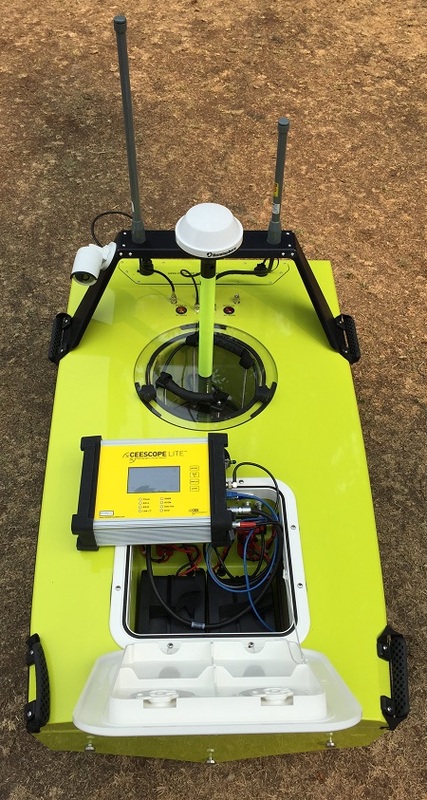 The CEE-USV is designed with the minimum number of separate components, cables, and interconnects. Our goal is to make the survey process as simple as possible from setup to data editing. CEE-USV™ uses the CEE-LINK™ shore module offering a simple solution for data transmission. Simply turn on the CEE-LINK­™ and survey data are instantly available on the shore, ready to acquire with HYPACK®, Hydromagic, or any other hydrographic package. With an internal 9hr+ rechargeable battery, the CEE-LINK™ unit is self-contained, waterproof, and hassle-free, with just one setting to worry about – “on” or “off”. With an external Ethernet input on the USV, high definition video and other ancillary data may be transmitted to the shore through the survey data link. Antennae are raised above the water on the wing of the CEE-USV™ to greatly improve data range. Several antennae options are available to maximize operational range, up to and beyond 1km (3,300ft) distance. To learn more about the CEE-LINK™ CLICK HERE to download the brochure. The CEE-USV™ is highly seaworthy with power packs and the CEESCOPE-LITE instrument held under a sealed watertight hatch. Batteries may be swapped in seconds without having to disconnect any of the CEESCOPE-LITE cables or even power down any of the data systems. No long interruptions. All of the electrical systems on the CEE-USV™ are professionally installed with high capacity, high current wiring used throughout. No hobby grade or low quality switchgear or connectors are used, making the CEE-USV™ a confidence-inspiring and low risk investment. Manufactured to exceptional quality standards, CEE-USV™ is survey-grade durable and reliable. The fiberglass hull is exceptionally strong, and stainless steel skids screwed to the hull make easy deployment and recovery with no parts to snag or snap. Over sized motors drive heavy duty prop shafts with a belt link, providing significant protection against damage should debris become caught in the props. The optional long range performance antenna platform raises the data and navigation (RC) antennae up off the deck level, of vital significance for avoiding destructive interference of USV to shore radio signals over the water surface. The shore control transmitter continuously receives a feedback signal from the CEE-USV™ showing the battery health so there is no need to worry about running out of power during the survey. The transducer is mounted in the open hole through the boat, with no need for a moon pool or concerns about sealing a hole into the inside compartment. Even floating inverted, water cannot enter the CEE-USV hull. The CEE-USV with on-board video and long range data telemetry, CEE-LINK shore station and Hydromagic acquisition software. Watch the CEE-USV™ from unique underwater camera views, showing the high power propulsion system in closeup, with HYPACK acquisition software running on the shore. The CEESCOPE-LITE™ echo sounder used in the CEE-USV™ simplifies all aspects of remote data collection – including mobilization. Watch the CEE-USV™ in action with a CEESCOPE-LITE™ echo sounder system, video camera, and Trimble R8 GNSS on board, performing a marina dredging survey. 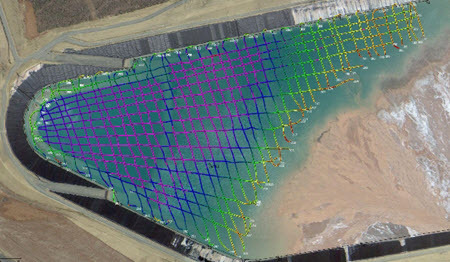 Hydrographic surveys in the mining environment presents a good example of the value of the CEE-USV for unmanned tailings and settling pond bathymetry. 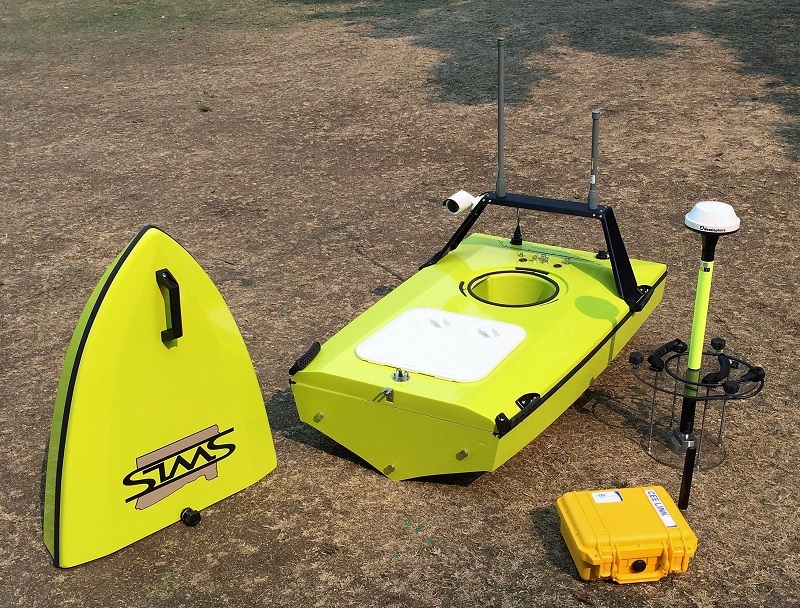 The CEE-USV is a perfect option for pipeline depth of burial surveys in the Alaskan wilderness. With limited or no access for a manned boat, shallow and narrow cross sections, the remotely-operated system brings maximum value for this operation. With a pH of under 3.0, the copper heap leach solution is no place for a Jon boat and a surveyor! 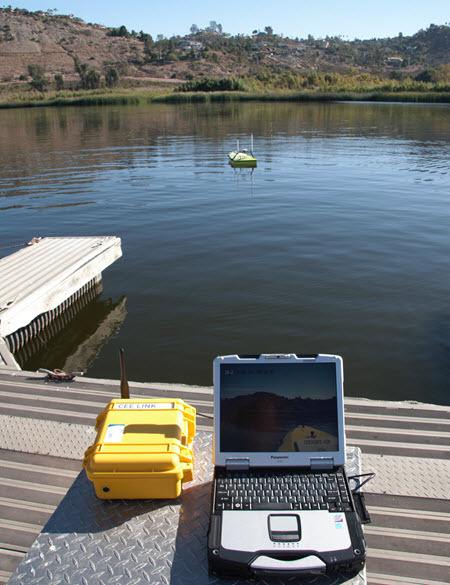 The CEE-USV™ is able to survey the hazardous mine reservoirs and the tailings impoundment too. Developed in partnership with marine autopilot specialists Dynautics Ltd, the CEE-PILOT™ navigation module offers a powerful upgrade for the CEE-USV™. With CEE-PILOT™ enabled, the vehicle can follow predefined line plans or travel to waypoints with spectacular accuracy. Ideal for repeating surveys or covering large areas, bathymetry results from an autopiloted survey are at the peak of what is achievable. Critically, there is NO REQUIREMENT for a remote PC on the vehicle and NO EXTRA SOFTWARE, maintaining the industry-leading usability of the CEE-USV™. LEARN MORE Learn more about CEE-PILOT™ navigation. The CEE-USV™ can accept GNSS data from an external, third party receiver by Bluetooth or cabled connection. Hemisphere Crescent Marine Beacon – Single frequency L1 GPS receiver for cost effective USV surveying where differential corrections may be supplied by free SBAS systems such as WAAS or EGNOS. May also be used with MSK marine beacon corrections for a differential (DGPS) solution. Standard configuration includes 10Hz position update rate. Supplied with the Hemisphere A31 antenna with beacon. The subscription L-Band GNSS option brings up to 10cm precision to the CEE-USV™ position data with no requirement for a base station. Using both GPS and GLONASS satellites, performance with a restricted sky view is greatly superior to submeter SBAS systems. Hemisphere Eclipse II (Atlas) – This GNSS option presents a new approach to obtaining accurate decimeter positioning anywhere in the world. The CEE-USV™ with Hemisphere ECLIPSE is supplied with a basic level (L1 only) capability. A separate subscription to the the Atlas L-Band correction service activates the dual frequency L1/L2 receiver operation, GLONASS signal reception, and the Atlas corrections themselves. This approach allows the user to minimize capital investment in GNSS hardware, and only pay for required accuracy when needed. These multi frequency NovAtel OEMV6 receiver options offer centimeter-level precision and accurate elevation measurements for recording of “RTK tides”. 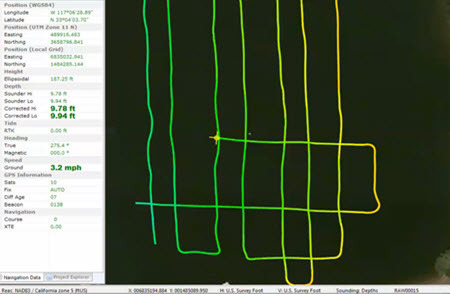 Both options allow internal recording of raw GNSS pseudorange data for post processed precise positioning using Continuously Operating Reference Station (CORS) derived corrections. NovAtel 628 – Multi frequency L1/L2/L5 GNSS option with internal RAW data recording to allow post processing to an accurate solution without the need for a local RTK base station. with L-Band corrections for better than 10 cm accuracy with a subscription to the TerraStar corrections service. The L-band option is typically selected where free SBAS or beacon corrections are unavailable and it is not practical or necessary to set up a local RTK base station. Supplied with the NovAtel GPS-702-GGL antenna. NovAtel 628 RTK – Multi frequency L1/L2/L5 GNSS receiver with RTK capability, allowing the CEE-USV™ to connect to a local RTK base station and receive real time kinematic differential corrections for cm-level precision. Typically selected when water surface elevation (tide) is being measured using the satellite positioning system and not traditional (eg tide gauge) methods. For hydrographic surveying within existing Trimble® infrastructure, the CEE-USV™ RTK-BD970 using the Maxwell™ 6 receiver technology will facilitate trouble-free connectivity with Trimble base station receivers. For users who are keen to maintain equipment consistency and interoperability, the Trimble CEE-USV™ option was developed to fit seamlessly into existing networks. Trimble BD970 – This advanced receiver installed inside the CEE-USV™ data module features an Ethernet input allowing use of cell phone network corrections (Trimble CenterPoint™ RTX) from an NTRIP caster, and will receive CMRx – and all other – format RTK corrections from a Trimble base station. The latest generation rugged GA 830 antenna is supplied, although this option may also be ordered without an antenna or firmware activation for dealer supply. A Satel 400-470 MHz UHF radio is installed inside the CEE-USV™ data module to seamlessly receive RTK correction from the base station for all RTK GNSS options. 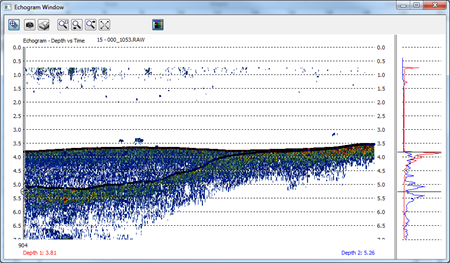 The complete survey dataset is available on the shore PC in real time – including the full water column echogram. Perform quality control on the fly and follow pre-planned survey lines whether using HYPACK® or Hydromagic software. After data editing is complete, the survey results may be exported as a soundings point cloud of position and elevation or depth. Alternatively, TIN modeling may be used to produce a contour or matrix surface for dredge or water volume calculations. A key feature of the CEE-USV™ is its integrated data management and telemetry package. The CEESCOPE-LITE™ echo sounder is paired with one (or more) CEE LINK™ shore radio modules to allow the operator to communicate with the echo sounder and any connected instruments. Simply turn on the CEE LINK™ and communication is immediately established with the CEESCOPE-LITE™ on the remote survey boat. The CEE-USV™ uses a 5.8 GHZ WiFi telemetry system to transmit survey data to the shore CEE LINK™ base station. The telemetry link is two-way and acts just like an Ethernet LAN cable connection. The network connection allows the operator to remotely adjust echo sounder parameters or communicate with any ancillary equipment connected to the CEESCOPE-LITE™ Ethernet data input port. Auto-link operation – The CEE-USV™ and CEE LINK™ shore module automatically connect whenever powered-up and in range. Network architecture – Other network-enabled devices such as an Ethernet camera may be connected to the CEE-USV™. Download the CEE-LINK™ data sheet HERE. Remote-control utility software. Allows the operator to change CEE-USV™ echo sounder settings over the telemetry link, and can be used to toggle internal data recording on or off. Adjust sound velocity, survey max depth, and echo sounder sonic parameters such as pulse length, gain and detection threshold while the survey USV drone is in action. A dedicated driver for the CEE-USV™ echo sounder and GNSS makes the setup and acquisition process easy. While conducting the survey, the clear navigation and data display on the shore PC is ideal for driving the USV based on the laptop display. Easily importing background maps and simple data manipulation procedures to generate contour and depth-color plots are are benefits of this entry-level affordable hydrographic survey package. LEARN MORE. As the industry standard professional-grade hydrographic software package, every survey scenario can be handled. Data editing capability is significant, with time-saving tools to filter, reduce, and qualify collected data. Dual frequency echo sounder data is superbly visualised, and sub bottom features may be re-digitized. Exceptionally detailed real-time data views and a color-coded survey coverage matrix mean the operator is always aware of the data quality during the survey. Useful features aimed at remote survey boats and drones make single-person operation easy. LEARN MORE. Surveying effluent ponds and industrial processes water may present a difficult challenge for a manned boat; access and safety challenges are eliminated with a USV. Information about sediment deposition may be inferred from dual frequency echo sounding surveys. Tailings storage facilities are ideal survey locations for a USV. Often existing survey methods are rudimentary and time-consuming, offering a poor view on the water volumes in the TSF. Using a USV can promote high quality repeating surveys for a better understanding of water resources. The ARC-Boat, manufactured by HR Wallingford is a capable instrument platform that may be used for deployment of various sensor types in addition to, or in place of the single beam sonar and GPS package installed on the CEE-USV™. The ARC-Boat was initially designed as an acoustic Doppler current profiler (ADCP) platform, specifically for the purpose of making safe unmanned measurements of river discharge or stream flow. Instead of using a manned boat or deploying a tethered boat from a bridge, using an unmanned boat offers significant advantages in safety and data quality. The ARC-Boat (and CEE-USV™) is designed to accommodate all of the ADCP types in use for stream gauging activities. If you are interested in ADCP discharge measurements then please visit the ARC-Boat page.